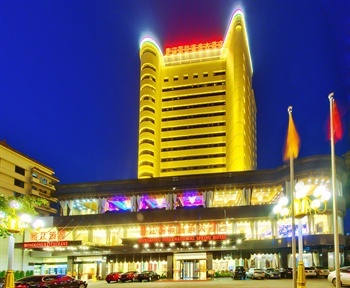 The Haikou International Hot Spring Hotel (Haikou Xiangjiang Guoji Wenquan Dajiudian) is located 1 km (0.6 mi) from East Haikou Raiway Station and 8 km (5 mi) from Pearl Square in central Haikou. The on-site restaurant serves Chinese and Western cuisine. A coffee shop and lobby bar provide additional spaces for guests to unwind with a drink or meet up with friends. Business travelers have access to the hotel's fully equipped meeting rooms and business center. A banquet hall is on hand for large social or corporate events. Guests with free time can relax in the hot spring, work out in the gym or indulge in the spa or massage services. For extra fun, a nightclub, game room and karaoke facilities are also on the premises.